Here’s a wonderful opportunity for our youth to spend a casual hour asking questions of Her Eminence Dagmo Kusho (aka Dagmola). Would you like to know more about Dagmola’s life in Tibet and what it was like for her growing up there? You might read her wonderfully entertaining autobiography, Princess in the Land of Snows, as preparation for this Q&A session. Her Eminence Dagmo Kusho Sakya, also known as Dagmola, was born in Kham, Eastern Tibet. As the niece of one of the most highly realized Sakya Masters of the twentieth century, H.E. Dezhung Rinpoche III, her training in Buddhist practice began at an early age. She has received extensive teachings and empowerments from many great lamas of all four schools of Tibetan Buddhism throughout her lifetime. Dagyum Kusho is the wife of H.H. Jigdal Dagchen Sakya Dorje Chang of the Khön lineage, a Head Lama of the Sakya order of Tibetan Buddhism. She is currently the Acting Head Lama of the Sakya Monastery of Tibetan Buddhism in Seattle, WA. 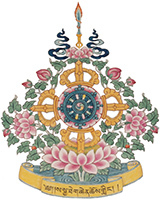 Dagyum Kusho specializes in Tara empowerments, practices, and teachings, and has many students throughout the world.